Brenda is just an ordinary woman in Bristol. She was questioned on the street by a BBC journalist and she said that she was fed up with politics – there is too much of it about at the moment – and she just wanted to live her life in peace. That is a bit of a paraphrase, but only a bit. Let me be clear, I do not want an election. 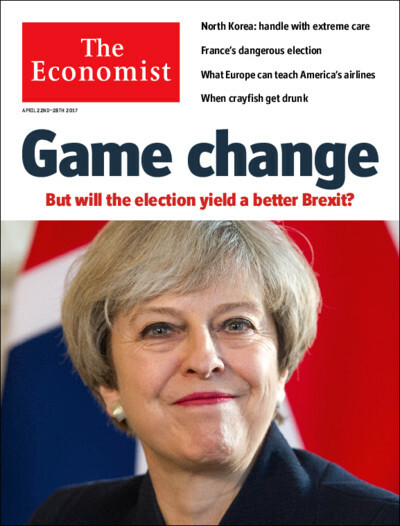 What is the point in a fixed-term parliament if an insecure Prime Minister decides that she needs a personal mandate for her mendacity and push for majoritarianism and the limited state? However, if we are going to have one – precipitated to some extent by the EU’s interregnum over exit terms – then so be it. But this is no ordinary election. I’m 53 and I believe this is the most important election in my lifetime. We can let the Conservative Party for the foreseable future dominate the executive and legislature (not to say judiciary if recent experience is anything to go by) or we can stand up for something bigger. This is not a party-political election in the normal sense. Notwithstanding Brexit, this is an election to stand up for public services, the NHS, education, housing, social care, the environment, liberty and decency. All of these things the Conservative Party seem to be willing to denude or abolish in pursuit of power. Not the public good. This will be an ugly island if May achieves her aim. All opposition parties have to work together on this one. This is not about Labour, LibDems, SNP, Green. This is about a future. Brenda needs to engage, vote and learn. I am a little bit too late sometimes to the party. 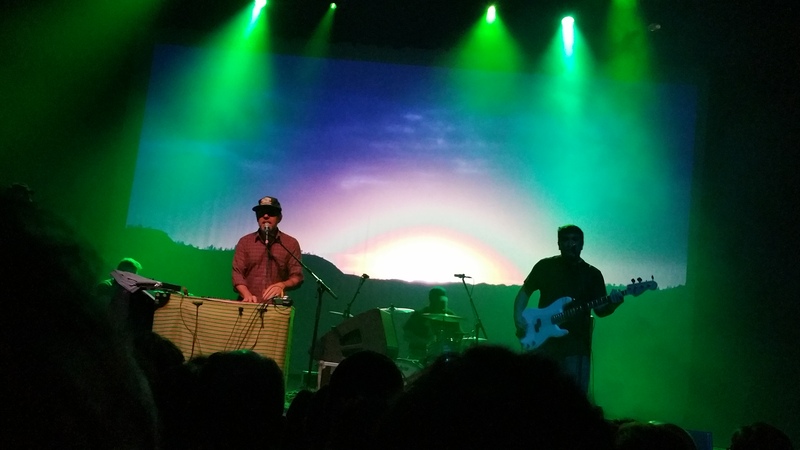 Somewhere I heard that Grandaddy had sort-of reformed and were doing some shows. Into the ether I went, discovered that they were playing in Brighton, UK, and tried to buy tickets. Sold out. Next option, Brussels’ Ancienne Belgique, 5 April. It seemed like a good idea at the time. 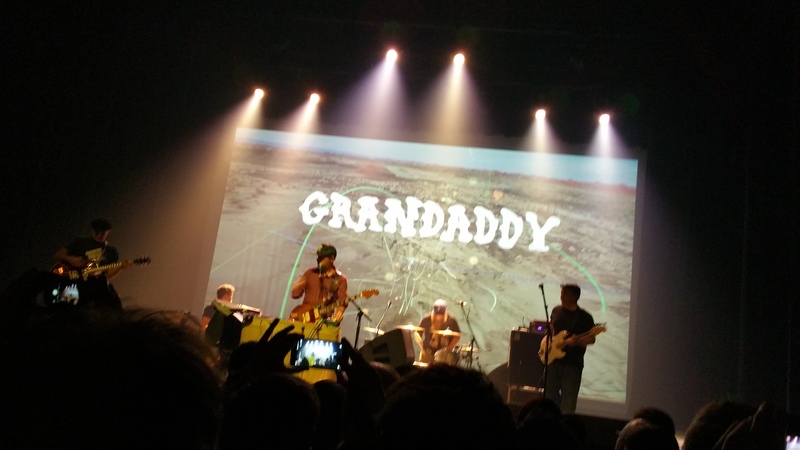 And what did I know about Grandaddy? 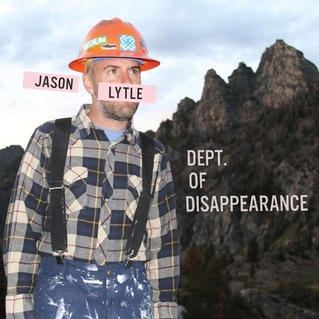 Well, eventually I made the link between Jason Lytle – whose solo album, The Department of Disappearance (right) I’d bought a few years’ earlier – and Grandaddy. Lytle has a distinctive voice, so it did not take much to make the connection once heard. And I’m a sucker for lumberjack shirts. I’ve also got into the frame of mind that I missed too many good gigs when I was younger thinking that there would always be another chance. I’m not so sure now. Hence the nonsense of going to Brussels. 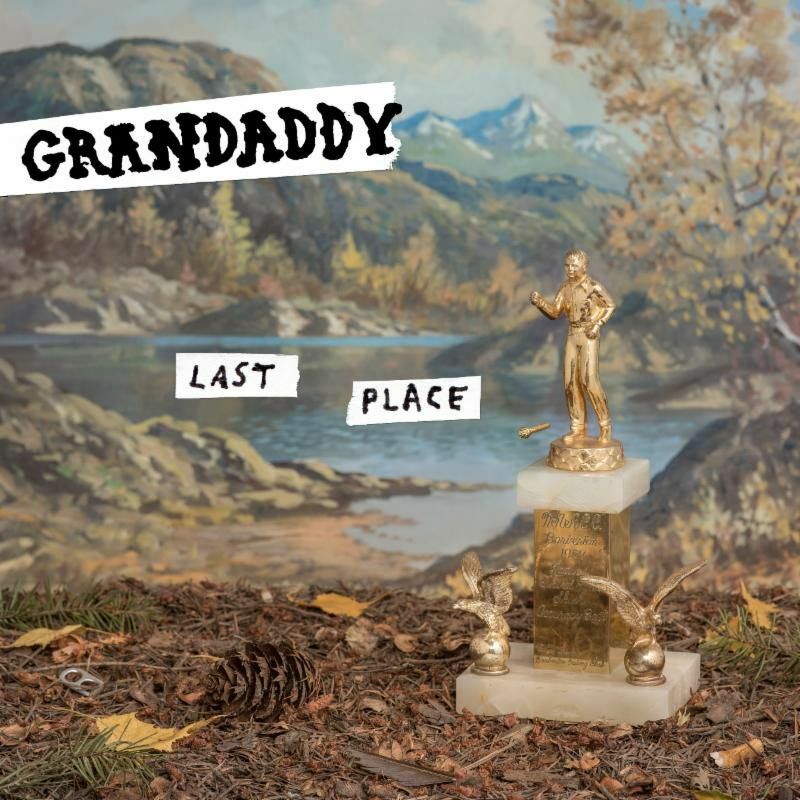 So, in preparation for the gig, I bought the new album, Last Place, which the Guardian newspaper described as “solid rather than spectacular”. Apparently, I should have bought the first two albums, these were the dizzy heights. At the gig, I suspect Lytle himself recognised this and played extensively from them. A greying, largely male, audience was appreciative of this. It was anything but a sales push on Last Place. That said, there are a number of tracks which, I suspect, Lytle himself regards as up to the mark. Much of it is disconcerting. So, I don’t wanna live here any more has the preceding line, “I’ve just moved here”. Seemingly autobiographical – Lytle moved from Montana to Oregon (in the Trumpian world, both sound places to avoid) and perhaps regretted it. Many of us have had that feeling, at least between houses if not states. Keeping up the melancholy, This is the Part a journey to Oregon living maybe? “This is the part, Some call a broken heart; Put down the phone, There’s no one coming home.” Ah yes, this is 2000s world where there are still landline phones. The backdrop for the band on stage is a film depicting this world full of freight trains, trucks, cement factories and a lot of wilderness. Let’s go upbeat? The Way We Won’t is that pop song. Trademark melody, synth and guitar. The accompanying video, however, has a twist. Lyrically, I’m baffled. Maybe it is culturally too far away from me? “Less than an hour past control tower, On a big box store roof; Cinnamon smell and holiday sales, Why would we ever move?” Oh, I don’t know. I could find a reason. The gig, wonderful. Lytle’s voice is not the strongest and it needed a bit more amplification. He’s also not the most charismatic on stage and did not even introduce the band members apart from Shaun who’d stood in at last minute on guitar (photo top left, far left). I’m back in Germany for the first time in a month. I was not sure what I would find on the cigarette advertising front. 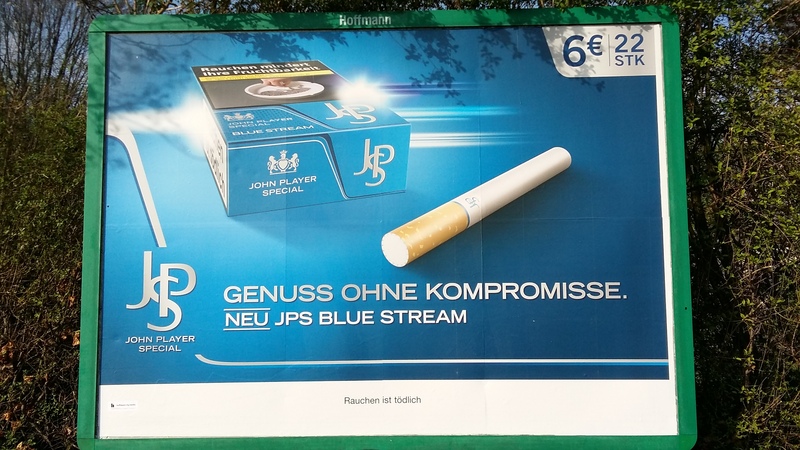 Domina nt at the moment seems to be JPS’s push into blue (a common colour used by e-cigarette manufacturers and mellow brands). The strapline says something like “enjoy without compromise”. Reading between the lines, does that mean it is not actually as good a proper killer cigarettes? This guy has a fantastic smokers’ cough! “Funky taste of dirt and hay”, he says. Twice. Whilst this review is priceless. I suspect he is not going to review cigarettes for a living any time soon. In fact, JPS have probably had a word with him already. Or at the very least given him a few packets of more potent “coffin sticks” to see him off quicker. I note that the current advertising approach where packets are the focus, the camera is angled to avoid the nasty graphic the manufacturers have to put on the front these days. This leaves the important branding visible. Still outrageous to see on street advertising.